For smashing his West African Certificate Examination and Joint Admission and Matriculation Examination in flying colours, a young Nigerian has been offered a scholarship abroad. 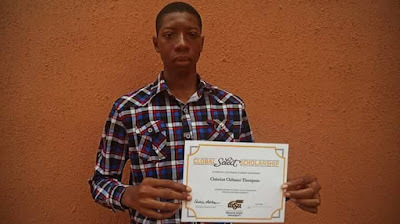 The brilliant student identified as Thompson Christian has earned himself scholarship abroad after passing his West African Certificate Examination and Joint Admission and Matriculation Examination excellently. Thompson scored an aggregate of 309 in JAMB and now his dream of studying abroad has come to reality. Thompson also came out in flying colours in WAEC. He made 7A’s and 2C’s in the recently released WAEC result. Armed with his excellent results, the young man applied to study Aerospace Engineering in USA. After verification of his results, he was granted scholarship at the Wichita State University in Kansas city. He has also been granted visa as he’s due to travel out for his studies.